What do you see? She was spirited, yes, and passionate, yes. 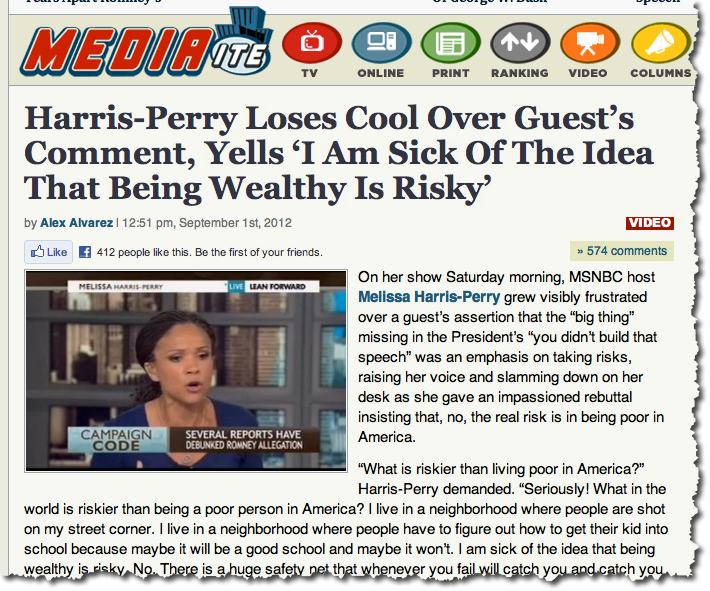 But there is a crucial observation to be made: she responded to the assertion being made by her guest: being wealthy is inherently risky and that the wealthy deserve special treatment for taking those risks. She did not attack the person making the assertion, just the assertion itself. Her guest’s comments were fair game. And for the first hour or so after Melissa made those comments, people on Twitter — people who had seen the show live — all were supportive. They used terms like “passionate”, “tell it like it is”, and “on fire”. Most importantly, the comments were focused on the substance of what was said more than how it was said. Their observations were organic, authentic, and without any preconceived notion of what they saw. But after a while a concerted effort began on blog sites to introduce a different preconception, to add a spin, and to move the focus to Harris-Perry’s behavior and mind set while tiptoeing away from the substance of her conversation. And as the blog commentary turned nastier, the messages on Twitter stopped being authentic viewpoints of individuals and became waves of nearly identical messages, with automated programs (“bots”) taking the lead. The story of what happened involves these two social media: the blog posts as they moved from a “hey, take a look at this” message to a condescending tone, and the commentary on Twitter that was driven by the blog posts. What is interesting is not just what people were saying but who (or what) was saying it. 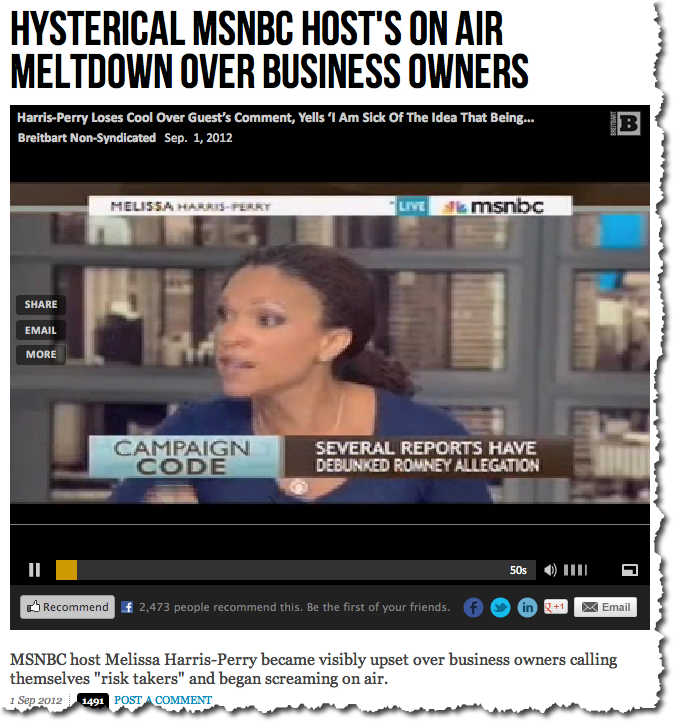 This is the start of the changing of emphasis: while live viewers saw Melissa as being “on fire”, Mediaite used the more negative “loses cool” and “yells”. The focus was moved from what she said to how she behaved. Still, the article itself is relatively mild, describing Melissa as frustrated and then impassioned. It wasn’t yet apparent that this was the first step in a journey of a thousand slurs. And that’s probably why, for the next hour or so, almost all tweets referencing this blog post were nonetheless positive about Harris-Perry. Mediaite was, at first, the only video available for web replay and people naturally pointed their Twitter followers to it. At 1:49pm Saturday, Jamil Smith, a producer for the show, tweeted about the official MSNBC blog post with a video clip. He neutrally described it as a “moment you can’t miss”. His became the most popular retweet for a while; allowing the tone on Twitter remained positive and approving. Now the tone had shifted into the full negative. The photo is more animated. The language is more dismissive. The wording is intensified: “Snaps”, “Apologized”, “Demanded”. No surprise, we know that Glen Beck views MSNBC as belonging to the dark side. This was worth about 200 Tweets (counting retweets). The tweeting is kicked off by automated bots (Twitterfeed being the most popular). That drove vistors to the web site, and many of them triggered their own clone tweets by pressing the “Tweet” button on the article. This is a pattern we see often. “Raw Story” postsed an entry later that evening but it is mild and non-inflammatory, and is mostly ignored by Twitter users. Count Dooku, is that you? “Hysterical”, “meltdown”, “yells”, “screaming”. Helped by a closely cropped video that loses all context for the quote. (Is it Shirley Sherrod time again?). I’ll note that “Hysterical” is a frequent term used by Breitbart fans to dismiss the left; Chris Matthews was described as being like a hysterical woman after his dust-up with Reince Priebus. Hysterical is definitely a term favored by misogynists. As with The Blaze, an initial round of bot posts drove people to the article, after which most tweets are from people pressing the “tweet this” button on the article. “Snapped”? 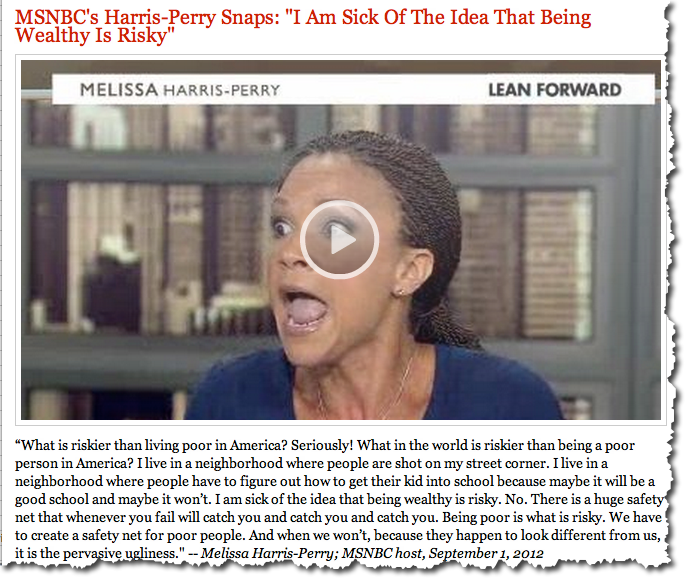 And a carefully picked still from the video that makes Harris-Perry look the most aggravated. (When you play the video, it does not start from that spot; they went out of their way to find just the right instant that makes her look shrill. Not even Breitbart did that). “Erupts”. “Interrupted”. “Demanded”. And they chose the exact same still as Real Clear Politics to make Melissa look as bad as possible. Nice of them to gives us the greatest hits of all the snarky blogs and photos that everyone else had posted. Who says aggregation isn’t serious journalism? Mr. @twsuccess bills himself as a Twitter “traffic generating program”. He may or may not care about the MHP show, but by 9:04am, his and about 20 or so other bots had tweeted the article. As before, this triggered a second phase: people going to the article and hitting the Tweet button. This kept up until about 3pm. While many of the other sites I’ve discussed pushed their stories via Twitter feeds, these were, as far as I can tell, other people’s Twitter feeds that automatically tweet certain types of content. Call it a collective action or a conspiracy, it was a group of seemingly independent bots that did the work. American Live Wire, on the other hand, owns dozens of Twitter accounts, and each of them tweeted this same story over and over again. This behavior is probably in violation of Twitter’s anti-spam rules, and ALW took steps to disguise the origin of their tweets. The post then became the darling of the other bots, and continued to be so for a while along with the HuffPo entry. By the end of the day Sunday, the discussion of Saturday’s show was dominated by these blog posts and people tweeting their headlines. The bots had done their job in getting the public started. 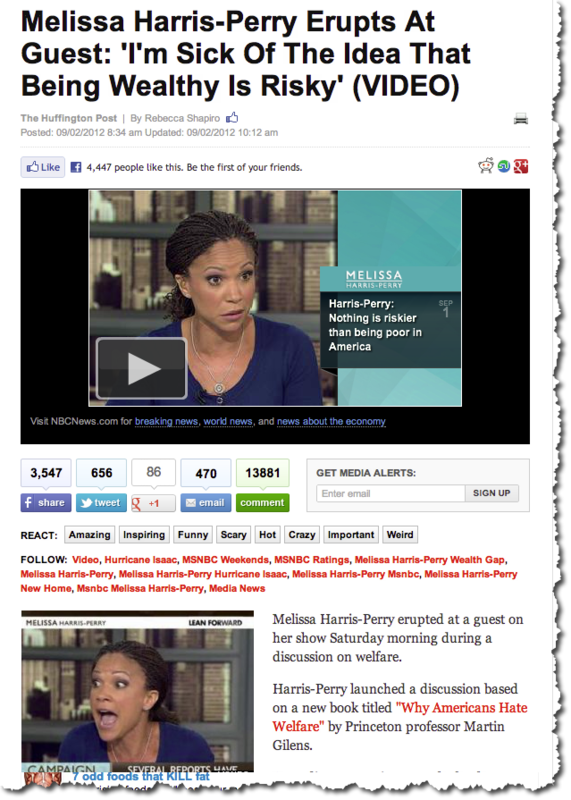 Melissa Harris-Perry was under a full fledged attack of the cloned tweets. There are two things I find worrying about all of this. The first is obvious: the use of automated tweeting — bots — to push a topic onto Twitter to try to gain traction. People click the link, read the article (or just a bit of it), and tweet its headline, none of which adds much value and borders on a sort of distributed, voluntary spam. People may not understand how these tools are being used to create a false impression of a dialog taking place on Twitter. People may not be aware of how Twitter is being manipulated, and it poses the same kind of risks as email scams and rogue websites. And people may be more gullible about Twitter, especially since it is a newer medium. The second concern, less obvious but more insidious, is the shift in language we saw as the blog posts progressed. 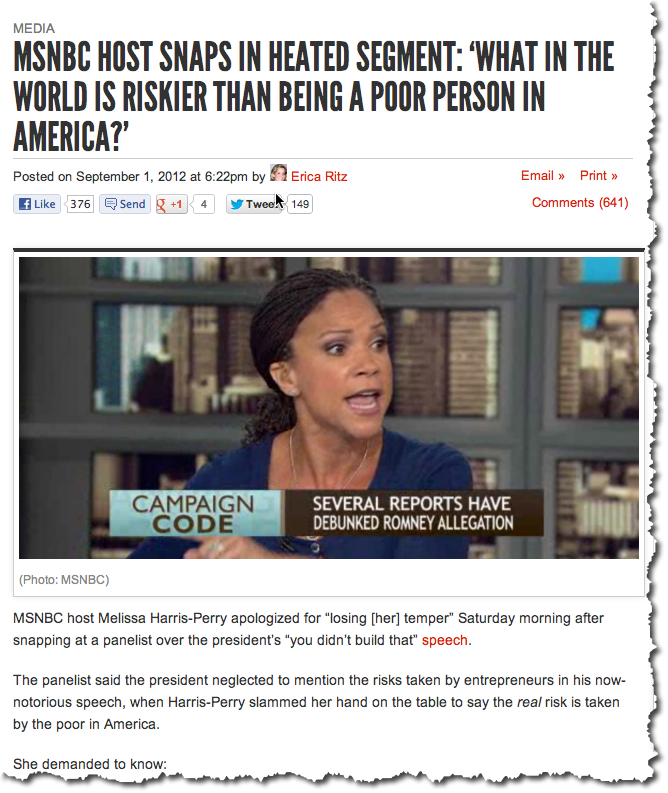 They moved from a discussion of the issues towards stereotyping Melissa Harris-Perry as “hysterical”. Changing her from passionate, as the shows viewers saw her, to angrily out of control, as the latter blog posts did, is unethical. I won’t go so far as to say that blogs are misogynist, sexist, or racist, but it’s clear that they are trying to get readers by using terms that are. And some of their readers may be convinced to complete the full journey. Someone making disparaging remarks about a TV Host is not the biggest worry of the day, and like all things on Twitter this will prove to be a tempest in a teacup. But this is an example of how people try to manipulate perceptions of current events through blog posts and social media. If these perceptions are picked up from Twitter and spread into other media, it means that Twitter is serving as a megaphone for those who wish to spin distortions. Or, as Obi-Wan once warned: Twitter. You will never find a more wretched hive of scum and villainy. We must be cautious. This entry was posted in Cable Channels, Media, News, Spam/Fraud, Twitter Techniques and tagged Melissa Harris-Perry, MHP Show, Twitter Bots, Twitter Spam by Charles McGuinness. Bookmark the permalink.